Yesterday, Constitutional Carry had its first public hearing in the Wisconsin legislature. I was proud to be able to offer testimony on behalf of the members and supporters of the Wisconsin Firearms Coalition — but I have to tell you, the anti-gun lobby was out in force! Senator Risser and Senator Taylor, notoriously anti-gun legislators, attacked gun owners and our Second Amendment rights as hard as they could. Not with facts mind you. They ridiculed and mocked gun owners and brought out every Bloomberg lie and distortion they could muster. Senator Taylor ridiculed the process and interrupted the Chair to push her anti-gun agenda. This is standard operating procedure for anti-gun legislators. They can’t win with the facts, so they resort to personal attacks and outright silliness. If we are to get a vote on Constitutional Carry legislation this year, we are going to have to counter their lies with grassroots pressure — more on that below. The committee lasted for a whopping 9 hours, and while I wasn’t the only one offering testimony in support of this bill, it was obvious that anti-gun organizations have us greatly outnumbered. In total, over 60 Bloomberg activists were on hand for the committee. And while gun owners in Wisconsin vastly outnumber these anti-gun activists, they are making a lot of noise. That’s why it’s essential that we pour pressure on the committee. Senator Taylor and Risser, and many others, are working to stop this bill — but they will settle for weakening this bill with harmful amendments. The timing of the committee vote isn’t clear, but it could happen fast. So please stand alongside us and help us advance this bill by contacting the committee members immediately. You can call them, email them, message them on Facebook, or all of the above, but please contact them right away and urge them to pass Senate Bill 169 WITH NO WEAKENING AMENDMENTS! The anti-gun media is trying to stop us, so are a committed bunch of legislators, and myriad Bloomberg-funded front-groups. But you and I live here. We vote here. And we will hold legislators accountable should they kill this bill. Make sure the committee understands that –- call now! And, if you can, please consider a donation right away to the Wisconsin Firearms Coalition to help us mobilize as many gun owners as possible. Whether you can give $500 to $1,000 as some have done, or whether $10 or $25 is more appropriate, please just do what you can right away! P.S. Yesterday, the Wisconsin Senate Judiciary and Public Safety Committee took up our Constitutional Carry legislation! 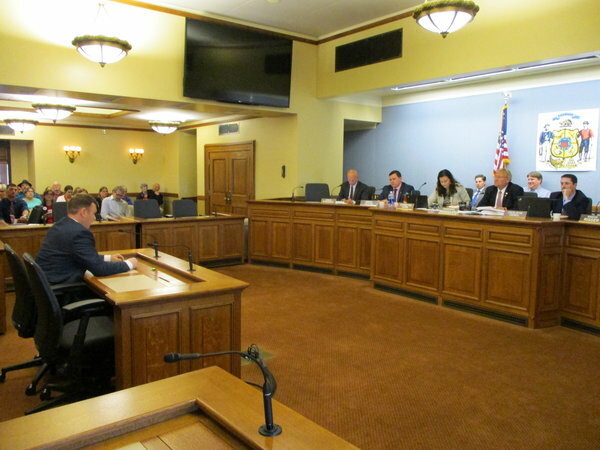 I was proud to be able to offer testimony on behalf of the members and supporters of the Wisconsin Firearms Coalition. The committee may consider this bill at any moment, so please contact the committee members immediately — using the information provided above — and urge them to advance the bill with no weakening amendments! And please consider an immediate donation to the Wisconsin Firearms Coalition, to help us mobilize as many gun owners as possible! Constitutional Carry Hearing Next Week!